Rolling out the red carpet for its premiere Platinum Blu-ray release, Disney has unveiled final specs for 'Sleeping Beauty' that include hours of high-def exclusives and never-before-seen bonus content. 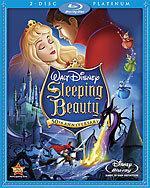 After months of anticipation amongst Disney fans, the studio has now finally confirmed complete tech specs and supplement details for the two-disc Blu-ray 'Sleeping Beauty,' and the title looks to easily earn the mantle of 'Platinum" with hours of bonus features and interactive next-gen content. Blu-ray exclusives will include a "Cine-Explore" mode (with full-motion PIP commentary by Pixar's John Lasseter, Andreas Deja and critic Leonard Maltin), "Maleficent's Challenge" interactive game, the "ultimate audio experience" Dragon Encounter allowing you to immersive yourself in a 7.1 surround sensory adventure, the "Restoring the Soundtrack" featurette, and a "Customized Living Menu" facilitating real-time customization to the disc's menus. Additional BD-Live content boasts a fully-functional "Disney BD-Live Network." Extras will include "Movie Chat" (allowing for synchronized viewing across the Internet), "Movie Mail" personalized user video messages, a "Movie Challenge" online interactive real-time trivia challenge, and "Disney Movie Rewards Live," featuring downloadable movie content such as avatars, wallpapers and more. Features shared with the standard DVD Platinum release of 'Sleeping Beauty' enjoy an all-new "Picture Perfect: The Making of Sleeping Beauty" documentary, additional "Four Artists Paint One Tree" featurette, the "Original Disneyland Sleeping Beauty Walk-Through Attraction With Walt Disney Imagineering" 3-D experience, four deleted songs and an alternate opening, a pair of interactive games ("Briar Rose's Enchanted Dance Game," "Fun with English") the Oscar-winning short film "Grand Canyon" ad a episode of the legendary Walt Disney TV series "The Peter Tchaikovsky Story." Tech specs for the Blu-ray will see the 75-minute feature film spread across a BD-50 dual-layer disc with 1080p/AVC MPEG-4 video and uncompressed English DTS-HD Lossless Master Audio 7.1 Surround audio. As previously announced, suggested retail price for the Blu-ray has been set at $35.98. You'll find final specs for 'Sleeping Beauty' linked from our Blu-ray Release Schedule, where it's indexed under October 7.